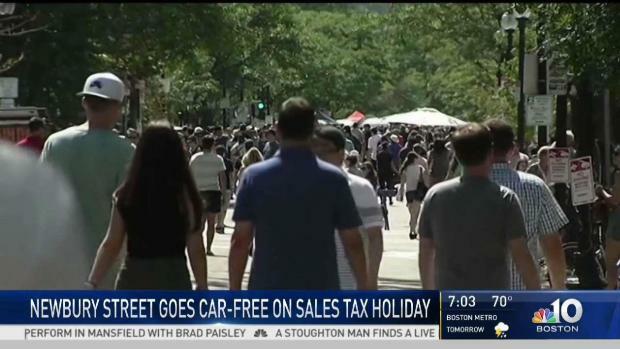 Boston's Newbury Street, known for its congestion and competitive parking, will be closed to cars on Sunday, just in time for tax-free weekend. The event, known as Open Newbury Street, typically draws thousands of people. Tents line the streets and restaurants set up tables on parking spots. Continued downpours in the area may move many of the vendors and pedestrians indoors, but that's not stopping shoppers. "We've got our umbrellas, and we're going to take the window of opportunity that our iPhone sales and go with it," one shopper said. Stephanie's on Newbury is among the many restaurants that set up seating areas on the street. Due to the rain, the set up closer to the restaurant. Boston's Newbury Street will go car-less for the second time this summer. "We'll still set up the patio and have it ready for guests, "said Sienne Witthens, a server at Stephanie's on Newbury. 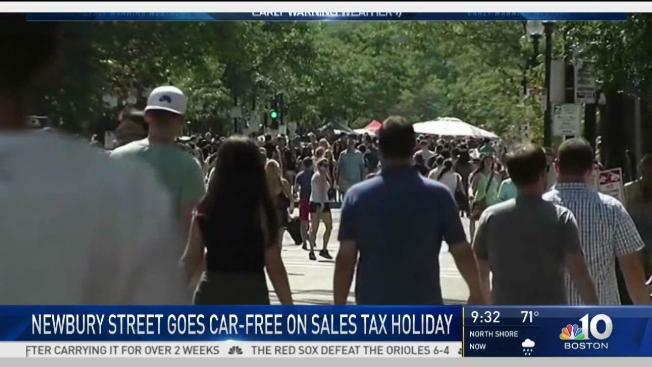 The event, coupled with the tax-free holiday, comes at a time when many shoppers are looking for back-to-school deals. Sunday is the second of three car-free events planned for this summer. The third Open Newbury Street will be held on September 9.